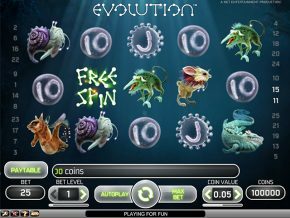 Hello there, Dave here again with another look at a slot machine game. We all love a good Western, am I right? Cowboys? Gunslingers? What’s not to like. The video slot Dead or Alive is a nice straightforward game that uses the whole cowboy theme to its advantage – and just about manages to stay clear of any copyright problems with it’s whistling sounds. Play the game and you’ll know what I’m talking about! There aren’t any huge jackpots to chase with this one, and there are only 9 pay lines, but that makes it nice and friendly for beginners who don’t want to bust the bank or play anything too complicated. Dead or Alive is a standard 5 reel type slot game with a cowboy theme. 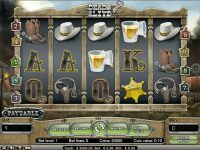 The graphics are nothing in comparison to for example the starburst slot, but some thought’s been put into the symbols and they include cowboy hat and boots, guns, a shot of whisky and so on. 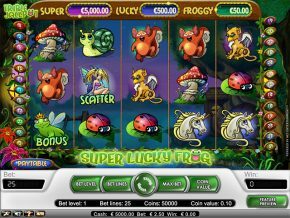 The basic graphics are not a surprise when you consider that you can bet from as little as €0.09 per spin, and the max bet per play is only €18. Although it’s a low stakes machine for beginners, there are some interesting features that can add up to reasonable payouts. If you’re lucky you could hit the top prize of 36,000 coins which is extremely good considering the low spin rates. If you’re a real beginner this game has a completely free practice play mode as well, so you can get to try out all the features for no cost. As you’d expect in a Western theme you need to watch out for Wanted Posters! In this game it acts as a wildcard. It doesn’t give any multipliers but it does increase your chances of making a paying combination across your lines. If you’re in the free-spin games then this wildcard can become “sticky”, remaining in play and massively increasing the chances of winning lines as you go through the free-spin plays. What’s the reason for the wanted poster? Too many gunslingers! And in this game 3 or more gun symbols starts up the bonus round. Don’t worry if you only see 2 as there are payouts for those. Let’s face it, with only 9 lines to play with you are never going to see as much win potential in this game as in the bigger slots with up to 30 lines. Nevertheless, for a beginner game there are some big potential wins to be had. During standard play the max win comes from getting 5-of-a-kind Wanted Posters and pays 1,500 coins. If you get into the free-spin round, though, that’s where things can get interesting quickly because up to 36,000 coins are up for grabs. If you want to know the full story you can see the game’s pay table at any time by clicking the icon in its screen. Free spins is where it’s at! Just get 3 or more of those six-shooters anywhere on the reels and you’re in. Not only does that get you 12 goes for free, partner, but anything you win here gets instantly doubled. Don’t forget those sticky wildcards come into play here too, so over the course of your 12 plays you could rack up an excellent stash if you’re lucky. You get to go again if you land 5 more wildcards during this bonus and you’ll be credited with 5 extra free spins on top of whatever’s left. 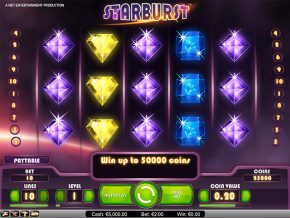 Nothing unusual or difficult here – first step is to choose your coin value from €0.01 to €0.50 and how many of the 9 lines you want to play on. You don’t even have to keep hitting the spin button if you don’t want to in this game as there is an automatic spin feature to do the hard work for you. If you win whilst the autospin is happening the game will add them to your credits total and carry on for you. There are also controls for the game settings and this is where you can adjust sound effects (keep that whistle I mentioned, it’s good! ), ambient sounds on or off, graphics and you can also reveal the history of your play showing bet amounts, winnings and so on.